How was the 600 Series tested? 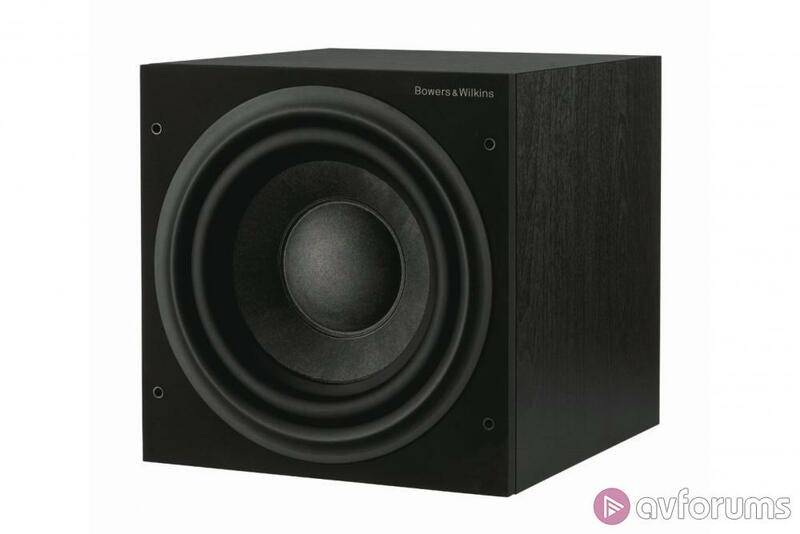 The Bowers & Wilkins 600 Series is the entry point in the company's latest range of speakers, boasting certain features first introduced in the flagship 800 Series. Primary of these is the use of B&W's new Continuum driver, which replaces the speaker manufacturer's traditional Kevlar weave in the hope of delivering a superior level of audio performance. We got our first taste of Continuum when reviewing the superb mid-range 700 Series, and the 600 Series offers many of the same performance benefits at a considerably lower price. The sixth generation 600 Series is the latest version of B&W's incredibly popular budget speakers, which often combine looks, build quality and performance with surprisingly competitive pricing. The system being reviewed here is a good example, with a combination of two 606 standmounts at the front, a pair of 607 standmounts on surround duties, a dedicated HTM6 centre speaker, and an ASW610 active subwoofer for all the bass action. All that can be picked up for £1,800, although if you'd rather have floorstanders at the front, there's also the 603 which will set you back £1,249 a pair. 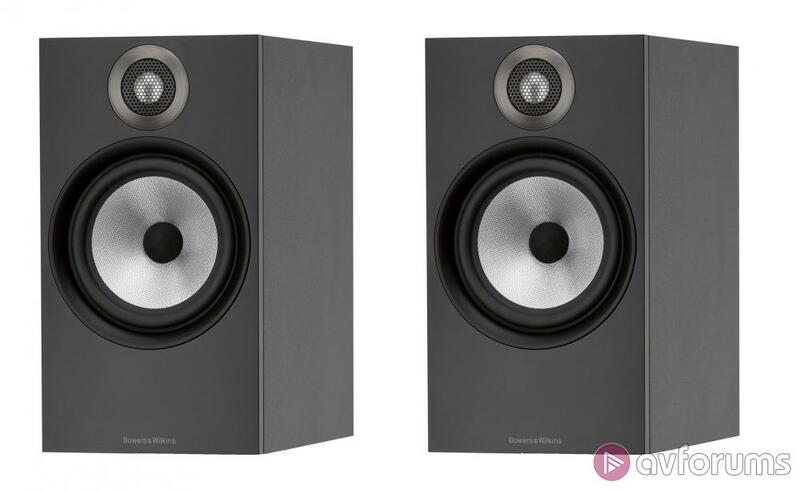 The Bowers & Wilkins 606 is the bigger of the two standmount speakers in the range, and retails for £549 a pair. The 606 is a reasonably large standmount that uses a 1-inch de-coupled double dome aluminium tweeter combined with a 6.5-inch Continuum bass/midrange driver designed to deliver a more neutral and precise sound quality. The cabinet is very nicely made considering the price point, and is rear-ported for deeper bass. The speakers have a nominal impedance of 8Ω, a claimed sensitivity of 88dB, and a frequency response that apparently goes down to 52Hz. The 606 uses a simple but clean design, with an attractive silver trim around the tweeter and bass drivers, while the silver Continuum weave is definitely more attractive than the garish yellow Kevlar that has graced B&W's speakers for decades. In fact, you might find yourself leaving the magnetic fabric grilles off, so you can admire these beauties. You get a choice of either a matte black finish with a matching black grille, or a satin white finish with a grey grille. At the rear are the usual dual binding posts for those who like to bi-amp or bi-wire. The 606 measures 190 x 345 x 300mm (WxHxD) and weighs in at 6.9kg. The Bowers & Wilkins HTM6 is a dedicated centre speaker designed to work seamlessly with other speakers in the 600 Series. The company has reduced its size compared to previous generations, in the hope that smaller dimensions will make it less intrusive in living rooms. It shares the same styling and build quality as the other speakers in the range, and also comes in the same choices of colour and finish. The HTM6 uses two 5-inch Continuum bass/midrange drivers either side of a 1-inch aluminium tweeter, along with a port at the rear and dual binding posts. The nominal impedance is 8Ω, the claimed sensitivity is 87dB and, as is often the case with a centre speaker, the claimed frequency response only goes down to 72Hz. The HTM6 measures 480 x 160 x 255mm (WxHxD), weighs 7.8kg, and costs £399. The 607 has the same minimalist design, excellent build quality, magnetic fabric grilles, dual binding posts, colours and finishes as the other speakers in the 600 Series. In addition, it measures 165 x 300 x 207mm (WxHxD), weighs in at 4.7kg, and sells for £399 a pair. 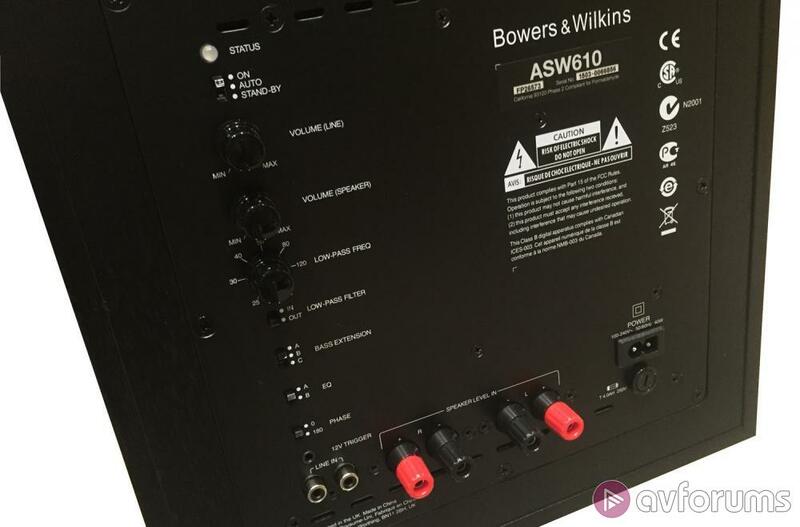 The Bowers & Wilkins ASW610 subwoofer is the final part of this 600 Series 5.1-channel system and handles the lower end of the frequency range. The sealed cabinet contains a forward-firing long-throw 10-inch paper/Aramid fibre cone driver, powered by 200W of built-in Class D amplification. The ASW610 has a claimed frequency response of 27-140Hz and comes with a choice of rubber or spiked feet. The minimalist styling matches the rest of the range, and the sub comes in a choice of matte black or matte white, with black or grey fabric grilles that attach using fasteners rather than magnets. At the rear of the ASW610 is a fairly typical set of controls for line and speaker volume, low-pass frequency settings, and a low-pass filter. There are also three bass extension settings, two EQ settings, and a 0-180 phase switch. In terms of connections, there’s a choice of stereo phono line and speaker level inputs, along with a 12V trigger and an auto-standby feature. The ASW610 measures 310 x 310 x 375mm (WxHxD), weighs in at 12.5kg, and retails for £499. If you prefer a smaller sub or have a limited budget, there's also the ASW608 that uses an 8-inch driver and costs £399. I tested the Bowers & Wilkins 600 Series 5.1-channel speaker system in my dedicated home cinema. I positioned the 606 standmount speakers at the front of the room on either side of my projector screen, I placed the HTM6 centre speaker between them, and the 607 standmount speakers were located at the sides and behind the main listening position. I placed the ASW610 subwoofer at the front, away from the wall and firing forwards. The 600 Series is flexible in terms of positioning, making set-up fairly straightforward. I tested the B&W 600 Series 5.1 system with a mixture of material ranging from Blu-ray and Ultra HD Blu-ray, CD, DVD-Audio, SACD and music streaming. My primary source was the Oppo UDP-203 4K Blu-ray player, and for amplification I used my reference Arcam AVR850 AV receiver in a 5.1-channel configuration. 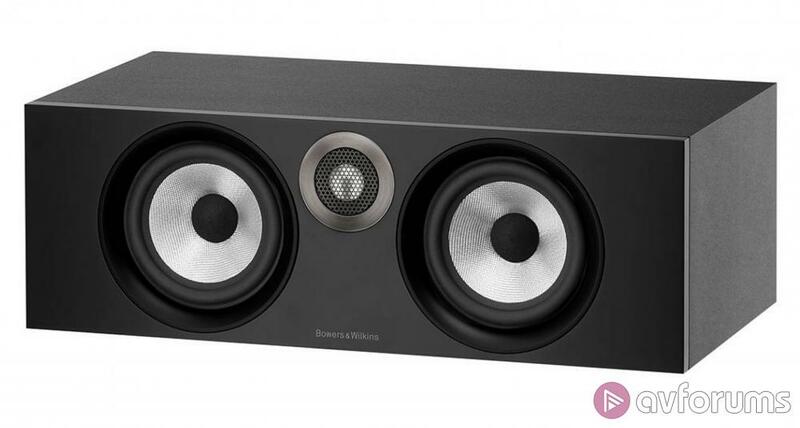 I had previously reviewed the Bowers & Wilkins 700 Series as a 5.1 system, so I had a fairly good idea of what to expect from the latest 600 Series. However, despite this I was still surprised at how good this new entry-level range is, especially as I have used B&W 600 speakers for more than a decade. The composition of Continuum may be a closely guarded secret, but the addition of the new driver has completely changed the signature sound for which B&W is famous: gone is the softer midrange caused by the Kevlar drivers, to be replaced with something that is considerably more neutral. There is now greater transparency to the acoustical signature and some exceptional detail retrieval. 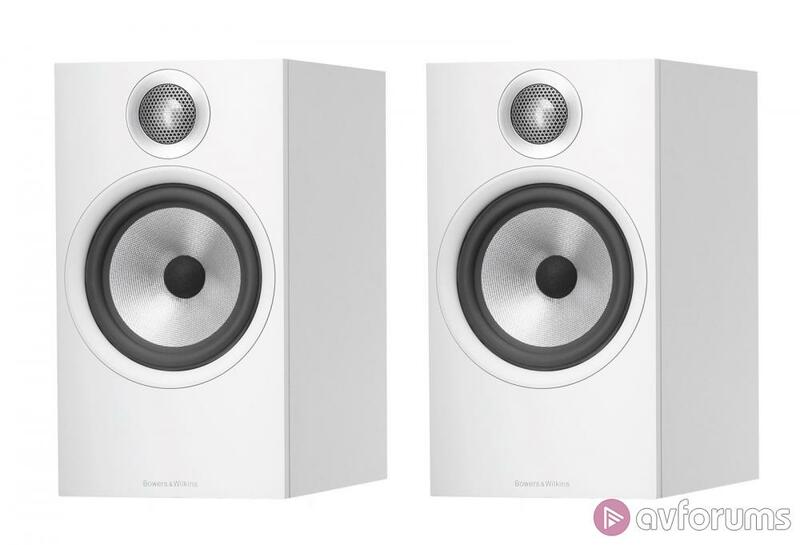 The speakers still retain a smoothness and sense of fun that I have always associated with Bowers & Wilkins, but there's now a greater impression of neutrality and improved clarity in the midrange. As a result, the five speakers in this system blend together seamlessly, resulting in a surround soundstage that is tonally balanced. The 606 standmounts create a solid presence at the front, and blend well with the HTM6 centre speaker. The match isn't perfect because the centre speaker is on its side, so it can never sound exactly the same. However, the use of the same tweeters and drivers certainly goes a long way towards creating a cohesive front soundstage. If you want all the front speakers to match perfectly, you'll need three identical models. The 606s demonstrated all the attributes I have mentioned so far, and proved extremely adept when it came to music. However, if you’re looking for a system that can handle music and movies in equal measure (and you have the budget), then you might want to consider the 603 floorstanders. I listened to the 5.1-channel SACD mix of David Bowie's Ziggy Stardust and the Spider's From Mars, and the seamless integration of these speakers is immediately apparent. The vocals are clear and focused, while there is a pleasing precision to the placement of instruments around the room. The ASW610 does a solid job as well, adding some responsive and tight bass to the proceedings. I then moved on to the Blu-ray of Edge of Tomorrow, which has a fantastic DTS-HD Master Audio soundtrack. I was immediately delighted by the 600 system’s ability to render the film's opening deep bass notes, as well as it's ability to deliver the opening beach assault in a manner that is both precise and exciting. It's an incredibly detailed and aggressive surround mix, with sounds being continually steered around the room. The four standmounts move effects around in a seamless fashion, and do a marvellous job of picking out all the small audio cues in the mix, so it sounds immersive rather than simply cacophonous. The centre speaker also ensures that the dialogue remains clear, no matter how busy the soundtrack gets. Once I was satisfied that the system could handle both music and action, I moved on to something with a bit more subtlety and created an unintentional Emily Blunt double-bill. A Quiet Place has some of the best uses of sound design that I've ever heard. The film might be about trying not to make any noise but there are always sounds in all the channels, often at kitten whisper levels. The 600 Series proves very adept at revealing all these tiny details, whether it's suppressed breathing, bare feet on sand, insects buzzing in the air, or the wind blowing through leaves. There is a complete and realistic sense of immersion that makes the soundtrack all the more enjoyable. The system also handles the sudden changes in dynamic range with great skill. Probably no film before or since has made such effective use of dynamic range, and when a loud noise is suddenly made I simply jumped out of my seat. The sub also makes its presence felt when neccessary, especially when the monsters arrive. Overall, the dynamic and neutral nature of the speakers in this system revealed that the 600 Series has the ability to deliver a precise surround experience that still retains that all-important sense of fun. 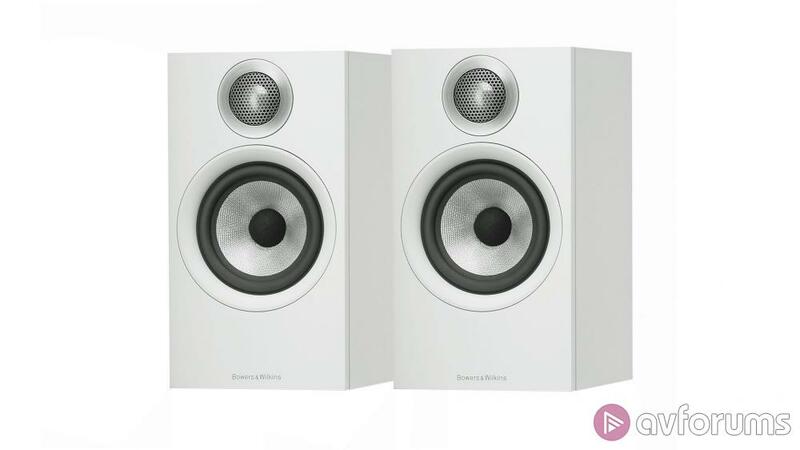 The Bowers & Wilkins 600 Series is yet another triumph from the British manufacturer, delivering a budget range that defies that pejorative tag with an excellent level of build quality and performance. The minimalist design is simple but eye-catching, with an elegant silver trim around the tweeters and drivers that matches the silver Continuum weave used in the bass/midrange drivers. The chances are that most people won't mourn the loss of the rather garish yellow Kevlar drivers that B&W has used for decades, but the addition of the new material isn't merely cosmetic. The composition of Continuum may be a closely guarded secret but it really works, resulting in a precise, transparent and hugely entertaining performance that still retains B&W's signature sound. The 606 standmount speakers provide a solid front soundstage, and sound much bigger than they look. They also integrate well with the HTM6 centre speaker and 607 surround speakers, to create a balanced and tonally cohesive system. The ASW610 delivers a solid bass foundation, and the resulting system is capable of delivering a dynamic but equally refined level of audio quality that comes highly recommended. 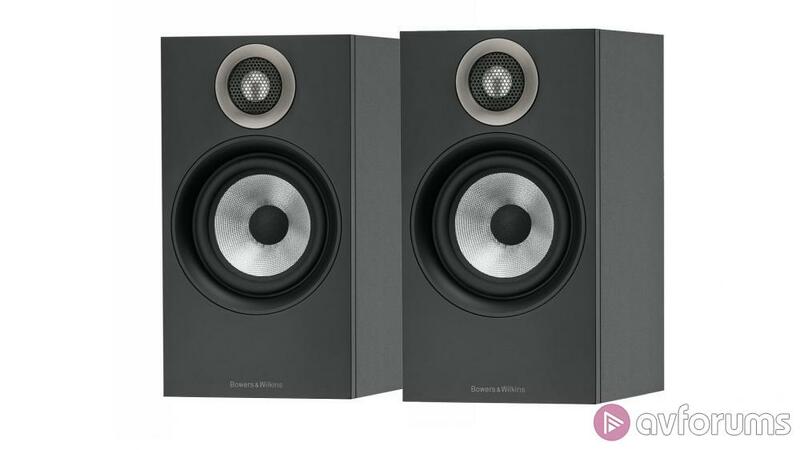 The Bowers & Wilkins 600 Series offers exceptional performance and decent value for money, which is sure to please existing fans and create plenty of new ones. However, there are some equally impressive and incredibly competitive alternatives available. The Acoustic Energy 100 Series is definitely worth considering, especially if you're on a budget. This 5.1-channel system is composed of two floorstanders, a centre speaker, a pair of standmounts and subwoofer, but you can pick all that up for just £1,250. They boast a modern aesthetic, a decent level of fit and finish, and an exciting and lively sound quality. All of which makes this affordable speaker package a class act and worthy of recommendation. However, the best alternative is probably the Q Acoustics 3050i Cinema Pack, which also consists of a pair of floorstanders, a dedicated centre speaker, two standmounts for the rears, and an active subwoofer. This impressive system benefits from innovations trickled down from the company's reference Concept 500 speaker, and the result is an open but detailed performance. This attractively designed and beautifully made speaker package will cost just £1,350, making it a definite best buy. Write your Bowers & Wilkins 600 Series 5.1 System Speaker review.